Jess Milton was Stuart McLean's longtime producer at The Vinyl Cafe. 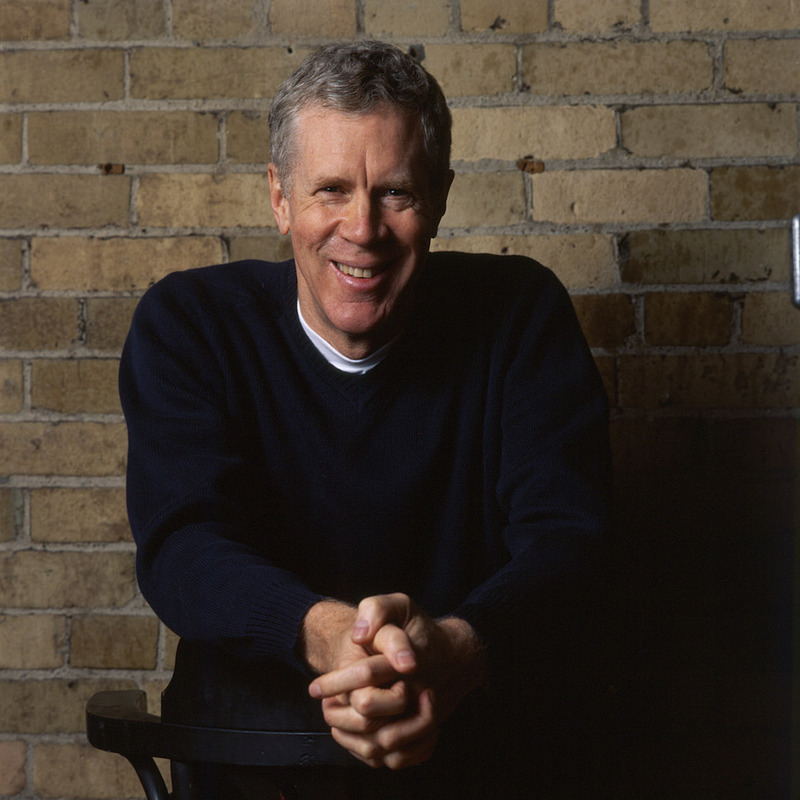 I have a photo of Stuart McLean hanging in my office. It was taken a number of years ago, backstage at the Rebecca Cohn Auditorium in Halifax. It’s a shot of Stuart and me arm-wrestling. He was captured midsentence, and while I don’t remember what he was saying, I know it was funny—I can tell by the look on his face and on mine. I love that photo because it epitomized our relationship in the decade-plus that I knew him before his death in February 2017. Stuart and I wrestled constantly with things—story ideas, plot lines, musical choices, tour schedules—but we did it with laughter. We worked together on a CBC show called The Vinyl Cafe, an eclectic mix of stories, music, the odd interview, essays; basically, whatever Stuart and David Amer, the show’s founding producer, felt like writing about and playing each week. The centrepiece of the show was the fictional stories that Stuart wrote. The stories were about Dave, a fictional character who ran a record store called, you guessed it, the Vinyl Cafe. The stories orbited the world of Dave; his wife, Morley; and their two kids, Sam and Stephanie. I can’t imagine my life without Stuart. We saw the world through the same lens: a lens of love and optimism. Whenever I was struggling with something, I called Stuart first. He was kind of a second husband/second father/older brother/weirdo uncle. No, that’s not right. He wasn’t any of those things. He was something I can’t put my finger on. He was…everything. Stuart liked to joke that he “pulled me out of the gutter.” It was a joke, but like all his best jokes, it came from a place of truth. He didn’t “make” me, but he made me realize who I was, before I’d figured it out myself. When I started producing The Vinyl Cafe, I had no idea what I was doing. I was just a kid. But he had faith in me and encouraged me to become the best version of myself. He saw what I could turn into, which meant I could see it too. I first started working with Stuart in spring 2003. The Vinyl Cafe was growing, and he and David needed part-time help answering emails, opening listener mail, and doing research. When Stuart offered me the job—I was twenty-three and one of his former students at Ryerson University—I wasn’t sure I wanted it. I already had three jobs—one at the Score, a sports television station, one as an intern on The National at CBC, and one as a bartender two nights a week at the Royal Canadian Yacht Club. But the idea of working alongside Stuart and David intrigued me. I liked that it was a small team. I liked David and Stuart. I liked the way they worked, which—quite frankly—didn’t feel much like work at all. We didn’t know his name. We didn’t know the year. But we figured he was around the same age as Stuart and that Stuart had been around seven to fifteen at the time. It didn’t take me long to find the story. The boy’s name is Roger Woodward. He is one of few who have gone over Niagara Falls and lived. He is not a daredevil. He wasn’t travelling in a padded barrel. He was only seven years old, and he only had a life jacket. This was the kid Stuart remembered. He wanted to talk to him. He wanted to hear what it was like. He wanted me to track Woodward down. And so this became the first story I worked on for Stuart. Looking back on it now, I think it was also the first time Stuart and I really got each other. The first time we realized this is going to work. But first, I had to find Woodward. We knew that he was American. We knew he had been vacationing with his family in Niagara Falls, New York. But we had no idea where Woodward was living now. This was more than forty years later. So I started calling every single R. Woodward in the US, chipping away at it over the summer. I sort of thought Stuart would tell me to let it go. He didn’t. Eventually, I located our Roger Woodward. Believe it or not, that was the easy part. Woodward didn’t want to talk about that day in 1960. He felt that his story had been lumped in with stories about daredevils—people who liked the fame. He didn’t want to tell us his story. I explained all of this to Stuart. I explained that I tried to get Woodward to tell me his story, but he didn’t want to. Stuart was obsessed with the idea of telling Woodward’s story. But he wouldn’t do it without Woodward’s permission, without his involvement. He wanted Woodward to tell us his story. We would be the conduit, the vessel that would get his version out into the world. Stuart grasped that stories are the best way for people to understand others: their lives, their struggles, their mistakes, their victories. And he believed that understanding others helps us understand ourselves. Woodward told me the whole story. He told me about floating over the falls. He told me what it felt like to think his life might come to an end. What he thought about in that moment and how it felt. And then he told me, with emotion, about the people who came to his rescue and who cared for him afterwards. I stayed up all night typing it up. I read it to Stuart the next day. By the end, we were both in tears. I called Woodward to read him the story. I told him we wanted to read it to him to make sure we got it right. After hearing it, he agreed to let us use it. I felt victorious. But Stuart wasn’t ready to stop there. Stuart knew that there was something powerful about hearing your own story. Over the years, I would learn why. Stuart knew that his role was to reflect. He was a mirror. He reflected others back to themselves. But he always reflected our best selves back to us. He showed us the best of us, and in doing so, he encouraged us to live up to that version of ourselves. In spring 2004, Stuart told Woodward’s story, the way he had told it to us, live on stage in Goderich, Ontario. Right after, we revealed that Woodward was live on the phone and had been listening to Stuart tell the story. As Woodward’s voice came in over the speakers in the theatre, the audience burst into applause, giving him a five-minute standing ovation. 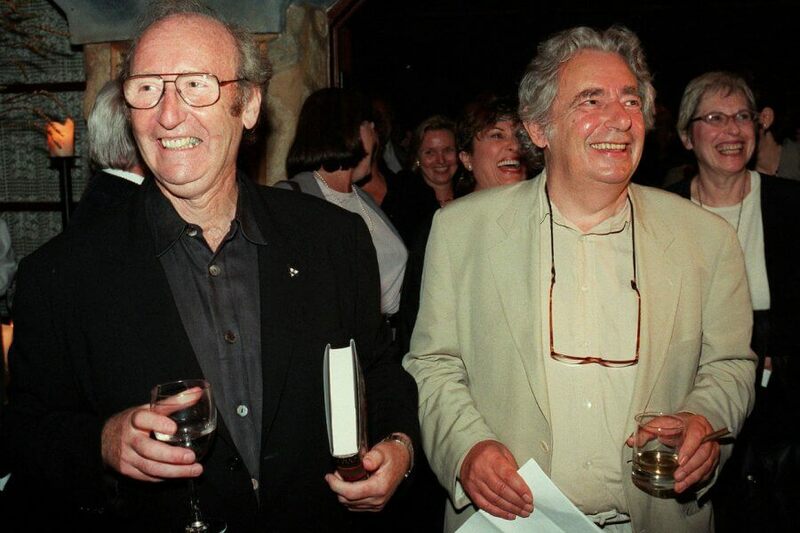 Over the next thirteen years, Stuart and I would go on to research and write hundreds of other stories together. But this one stays with me. Partly because it was the first time I realized why Stuart was so successful. He trusted his gut or, as he liked to call it, his “tummy.” Over the years, when we were trying to make a decision, he’d often ask me: “What does your tummy tell you?” He taught me to trust my tummy. More than that, he encouraged me to trust my intuition. To follow it. To be curious about where it would lead me. Woodward’s story could be seen as a tragedy. But that’s not the story that Stuart chose to tell. He told us a story about all the people who came together to make sure Woodward was okay. Stuart believed in love and he believed in goodness. And he knew that, on some level, they were the same thing and that one encouraged the other. He believed in people’s capacity to be good and their desire to do good. And he reminded us that if we act from a place of love, we will have a society always willing and able to do the right thing. Over the years, we got a lot of flak for our show being saccharine. It was a valid criticism. But it wasn’t an act. That is how Stuart lived. That is how he saw the world. He wasn’t ashamed of that. He didn’t apologize for it. When he hired me, I was fresh out of journalism school. I knew nothing, or nothing about producing a successful national radio show. But I saw the world the same way he did. And he gave me permission to own that. He gave me permission to see the good. Always. Though we didn’t talk about it, “good” was the guiding principal of Stuart’s fictional stories as well. Dave, owner of the fictional Vinyl Cafe, is a goof. But he’s a goof who stumbles into the muck while trying to do good. Over our fourteen years working together, Stuart and I also stumbled into a lot of muck. We argued about, well, just about everything: about where to travel and when, about whether to take the scenic route (Stuart teased me often, saying I “prayed to the altar of efficiency”), about how long it took him to do everything, and about how he was always late. I called this habit the “vortex,” and eventually, all I’d have to do was make my vortex sound effect—the noise of someone screaming while being sucked down a drain—and he’d know I was getting close to snapping. When we weren’t on the road, we lived in different cities. By now, I was in Ottawa. Stuart was in Toronto. But we would talk ten times a day. Sometimes more. Stuart would call to say he couldn’t find his glasses. Answer: look up high, on top of the bookshelf, on top of the fridge, on top of the coat rack. You’re always leaving them up high. He’d call to ask me how much was too much to spend on a treadmill. Answer: one dollar. You’ll never use it. You’re never home. He’d call say he wanted to give me a raise. Answer: no. We can’t afford it. He’d call to read me the new Dave and Morley story. To hash out ideas for a script. To tell me how much he loved that week’s story exchange. To tell me how much he didn’t like one of the songs we’d chosen for that week’s show. He’d call to read me something he’d just read in The New York Review of Books. To talk about politics. To give me an update on his mom. He’d call to ask about my dog and where we had gone on our run that morning. He worried, obsessively, that I was going to get lost in the woods. He’d tell me to be nicer to my husband. He’d try to get me to take a vacation. Sometimes he’d call for no reason at all. “Just calling to yak,” he’d say. His voice was the soundtrack of my days. Every day. Producing the radio show. Editing stories for our new CD. Listening to the show before it went to air and then again the day it aired on the radio. All those nights backstage. All those phone calls. All those nights on the road. I said there is a photo of Stuart hanging in my office. In fact, there are two: the second one was also taken in Halifax. This one was taken on our final Christmas tour. The second-last concert Stuart performed. Christmas was a special time of year for us. It started the year Dave cooked the family turkey. That was the very first Vinyl Cafe Christmas story, and it was the story that turned Christmas into a big deal at The Vinyl Cafe. Every year, we’d spend five weeks crammed into a tour bus, travelling across the country. It was our favourite time of year. The Christmas concerts felt like a family reunion. Over the years, so many families made our Christmas concert one of their traditions. I started to recognize faces out in the lobby, and they started to recognize mine. We got to know them. The Christmas tour was our tradition too. But planning a tour, especially a Christmas tour, is a tricky thing. There are only so many days in a year where you can perform Christmas carols and not be laughed out of town. We loved playing the Rebecca Cohn Auditorium in Halifax—where that first photo was taken—but we needed four or five shows there so everyone who wanted to attend the show could, and we didn’t have that many open days on the tour. And so I suggested we play an arena. Still, I was nervous. Partly because Stuart and I already knew what the rest of the country wouldn’t find out until the next morning: we would be suspending our Christmas tour; Stuart had been diagnosed with melanoma. I always wanted the show to be good, but this day especially, I wanted it to be great. The moment he walked on stage, I knew it would be: 5,000 audience members roared with excitement. Stuart looked back at me in the wings with a huge smile on his face. At the end of the show, during the finale song, people started taking out their phones and using the flashlight on their phones the way crowds used to use lighters at rock concerts. It was just a few people at first. And then it became hundreds. And then it became thousands. Thousands of people, holding light up into the darkness and swaying together to the music. It reminded me of something Stuart always said: he loved December, the darkest time of the year, because he loved our impulse to find light in the darkness—to create it if we could not find it. That’s the second photo that I have framed on my wall: Stuart standing in the sea of light in the Halifax arena. Whenever things seem dark, I look at it to remind me how much light there is in this wonderful world. And how even on the darkest days, you can find it.